Using anything else is a mugs game. 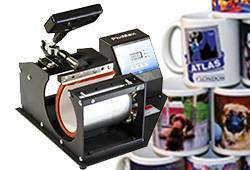 Create impressive personalised mugs with our reliable mug printing sublimation press. Turn boring blank mugs into brilliant, unique designs with our PixMax mug presses. Compact and portable, our mug printing equipment is simple to operate and come with Teflon coated press surfaces to make sure your fancy new mugs always turn out great. Our selection of premium sublimation mug presses are perfect for hobbyists, professionals and budding personalisation company owners to create amazing designs. Our mug printing equipment comes with the 12 Month MonsterShop warranty, so in the unlikely event anything goes wrong - we’ll replace or repair your equipment for free.